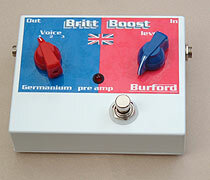 For sound samples from some of the Burford range of pedals please click here! 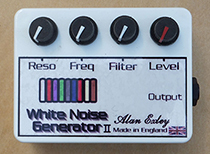 This is a sound generator, ideal for noise cancellation, sound tracks, like Sci-Fi or relaxation. Must be plugged into an amplifier. This unit uses a 9-volt battery, only supplied with battery in the UK. It has 4 controls, resonance, frequency, filter & volume, which are all interactive. Can be used to filter out background noise. 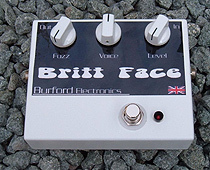 A unique Octave up fuzz, which will give you pure fuzz on one twist of a knob & octave fuzz on one twist of another knob. So you can have your fuzz setting for rich body & add octave fuzz to it or turn the fuzz down & just use the octave fuzz control for cutting lead. There is also a control called Sting, this is a tone filter that alters the voice of the octave from sharp to mellow. The octave is not over the top, on the lower register it is quite subtle, you can even play power chords and it holds together extremely well. Without that horrible modulation that is associated with some analogue octave up pedals even some of the legendary expensive ones. Try soloing somewhere from the 8th fret upwards, it is very responsive and particularly so around 12th/15th fret and even higher. Neck and back pick ups give different sounds. Even playing positions will give different responses. 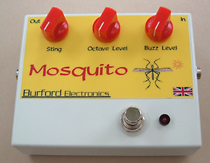 Buzz level - [standard fuzz level control]. Octave level - [octave fuzz level control]. Playing tips and techniques are….If you are using neck pick up, play close to it, if using bridge pick up play close to that one, try playing in different areas around each pick up. Also you are probably aware that for best octave sounds, hit the notes accurately and try not to hit adjacent strings as you are playing, this will give a ‘pure’ sound. Power chords usually work best between open strings and down to about the 8th fret, these tips will start you off, but most of all have fun! 2 & 3 - pre-selected boost positions with increased mid. [All three give slightly different boost voicing]. 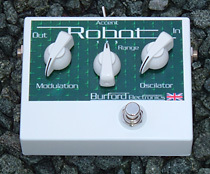 Fuzz control - this you can turn back from full fuzz to over drive settings with clarity, unlike it's predecessors which would lack treble, usually sounding quite thick. 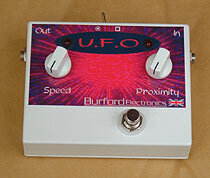 Hand-built in the heart of England by Alan Exley for Burford Electronics. On the e.q. Boost selector switch [mounted at top of pedal], to the left is the classic Rangemaster sound. To the right is mid and bass boost, this modification was done to the Rangemaster to act as a boost to overdrive tube amps. Tony Iommi in the early Black Sabbath used a modified Rangemaster. 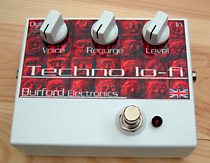 Tony Iommi used this mod. The signal to noise ratio is excellent, the transistor is selected, grade A quality, hence the very low noise. & is only switched on when the input jack is inserted. The Rangemaster was the one which Rory Gallagher, Tony Iommi, Brian May, Eric Clapton, Dave Gilmore & Jeff Beck just to name a few people, used for it’s legendary sound. The Burford mid frequency choke will remove a lot of the mid range, giving great rhythm properties and almost acoustic sounds. When wired in. it will be interactive with your tone control & gives great Jazz sounds as well. Works on all magnetic pick ups[not piezo]. Totally passive, no batteries, easy fit [some soldering skills required]. Hand built in the heart of England. Feed your guitar through this device and you will get the guitar sounds mixed with the sum and the difference between the guitar and the oscillator frequencies, producing 'metallic' overtones to your guitar and various strange techno sounds, depending on where the oscillator pitch is set. What was it used on? If you listen to the guitar solo on the track Paranoid, by Black Sabbath, you will hear pure distortion guitar on one side and ring modulation on the other. In the stereo image this sounds quite weird. I'm quite sure it's been used on many things. Another classic example is on the Doctor Who theme. It has two controls, modulation and oscillator. The modulation control adjusts the mix of the dry signal to be effected. The oscillator controls the pitch of the oscillator tone. It has two switches: one is accent, the other one is range. The accent adds another feature to the oscillation, which gives a slightly different character to the sound. The range switch has three ranges. 1 is the upper band (easier to tune to high frequencies). 2 is upper and lower band. 3 is the sub band. This gives low-fi, tremolo type sounds, (which can be quite "nasty"). Also there tends to be a "click", almost like interference from the oscillator - with the accent on you can get some bizarre type sounds by playing with or against the beats that are going on: all you need is root and octave. It also sounds very different if you play against the bridge. It has two jack sockets: one in and one out and it has true bypass. It also features pulsing L.E.D.s that pulse in rhythm with the effect. Speed control goes from a slow pulse to fast. This makes your lead playing sound like a sitar. For best results single note lines, root note and octave and picking, not suitable for full chords. As a starter - Try dropping the E string down to D, the A string will then become the fifth, The D string is now the octave. Play on the G-string start on 7th fret, the second octave of D and play a typical minor raga scale. All you have to do is to play close to the bridge of your guitar, it will work best with the bridge pick up however if two pick ups on together or neck pick up adjust hard and soft control. 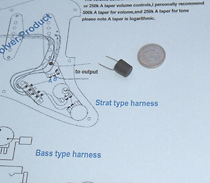 Humbucking pickups tend to be more favorable, due to the extra mid range frequencies. This is one thing missing from the psychedelic era of the sixties. 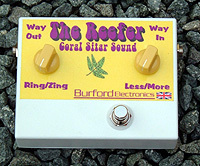 This is an interactive fuzz, great for techno wild and wacky sounds. Voice is a powerful active filter, which gives you, from normal ‘crunch tone’ through mid range ‘honk’ sounds to wah voicing and through ‘thick creamy’ fuzz tones. Regurge is a powerful voltage controlled filter that gives you straight signal through to synthetic sounds to weird envelope gurgling and is interactive with the voice control. Last one speaks for itself really, less or more between bypass and effect. No more stopping and fumbling around to set your solo levels on your guitar volume controls or using old graphics and E.Q. pedals to boost your volume! This completely transparent FX pedal will give you the true voice of your guitar and amplifier. 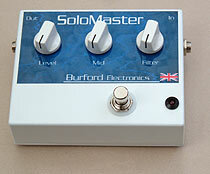 The Solo Master is a solo/rhythm foot pedal. 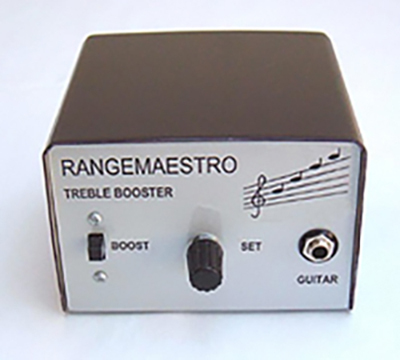 It is completely passive, noiseless, and uses true bypass which does not alter your guitar's natural voicing. It has a red LED which lights up when in the bypass position. Switch it to bypass position and adjust your amp setting for your solo sound, (you may require slight boost in middle and treble for the cutting edge). Once you have achieved your sound, switch the pedal on (that is with the LED off) and adjust the mid-range control on the pedal until you feel you have your rhythm sound. You can also adjust the filter to back off some of the treble edge. Once this is achieved, switch to bypass mode and compare your solo level (LED ON) to your rhythm level (LED OFF). If you still need to reduce your rhythm level use the volume control of the pedal accordingly. This pedal is completely passive and uses a 9 volt battery ONLY to power the LED light. This new module is completely passive and updates your Stratocaster's tone and volume controls - with easy fit instructions. This will give you linear response, calibrate your volume control - in other words, no more treble loss or uneven volume control. 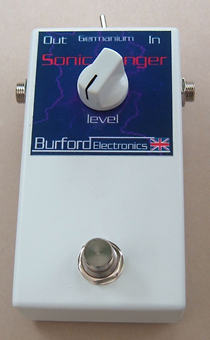 First tone control will act as master treble filter for pitch ups with no "muddy dump" at one end. Tone control 2 will act as a mid-range filter for all pick ups to give extra funky sounds to "acousticy" style voicing. Both of these tone controls will interact for extra tonal variations. Fit this to your guitar and it recalibrates tone and volume to give an even response, (usable controls). As reviewed in "Total Guitar". Full wiring diagrams and fitting instructions. Reviewed In "Total Guitar" (Feb 2003 issue - page 123) - 4 out of 5 stars .